A few years ago, I started reading electronic books on various devices. Today, I hardly read any physical book, except for comic books and highly technical subjects. I’m avidly following the e-book industry and fascinated by how quickly it is growing. At the same time, I’m feeling pangs of nostalgia for old paperbacks from my youth! 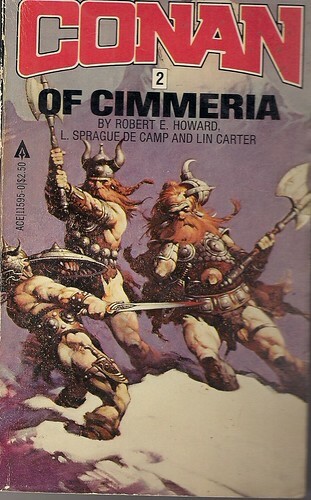 Case in point, this Ace paperback, Robert E. Howard’s Conan of Cimmeria. I found this at Half Price Books the other day, in great condition, even poly-bagged, for a mere $2. Frank Frazetta’s paintings on these books set the world on fire and helped sell millions of Conan books all over the world. 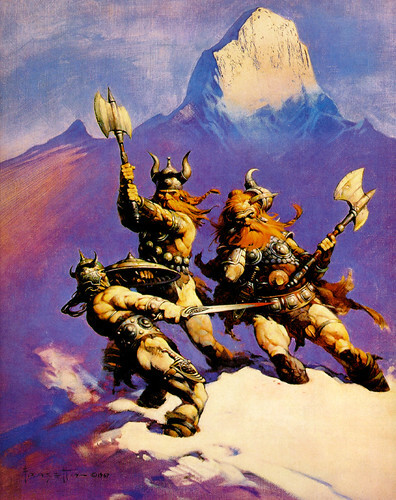 This collection of stories contains The Frost Giant’s Daughter, which is portrayed to great effect by Frazetta. Who couldn’t help but picture Frazetta’s creations in their mind while reading Howard’s purple prose? Frazetta’s full cover painting for this scene is even more glorious. There were several different editions of the these Conan paperbacks. The one I just bought definitely is published by “Ace” and the back cover is just Frazetta’s painting, sans any cover copy. It was published in 1983 and also contains some interior illustrations by Esteban Moroto. Lancer published the original paperback series in the 1970s with a different cover treatment. Gary Romeo has a terrific article titled Defending the Lancers on his website, with a review for each Conan paperback and a gallery of each cover. When I made the switch to reading e-books, I was also getting ready to move to a new house. I had tons of physical books that I dreaded moving. I sold stuff to a used bookstore and donated the rest to a local library. But there were a few special books that I just couldn’t let go. 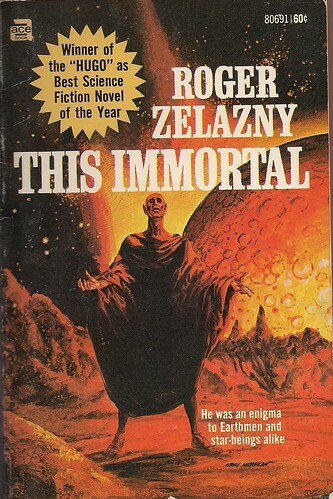 One of them was the 1965 Ace paperback edition of Roger Zelazny’s This Immortal. I haven’t read this novel in decades, but I love the cover, even if it has little to do with the story inside. The cover painting was by Gray Morrow, a very talented artist who also drew comics for Marvel and DC, including the very first Man-Thing solo story. You couldn’t help but have this cover strike out at you on the newsstand from any direction. That red landscape, with the moon hovering impossibly close by in the background, is pure SF pulpy goodness! Zelazny has always been one of my top favorite SF writers, his Amber series is something I can re-read every few years, as well as Doorways in the Sand. I looked to see if I could find a scan of this painting in original form, and came up empty. Instead I discovered a very nice article on Gray Morrow on the Bronze Age of Blogs. I had completely forgotten that Morrow had also worked on The Illustrated Roger Zelazny, a special album that he produced for Byron Preiss. It was sad to read that Morrow committed suicide in 2001. He was a very unique artist with an unmistakable style that I’ll never forget. Nuff Said.